I’d never tried Peruvian food but am now a convert! 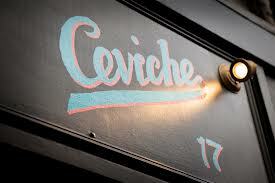 Ceviche was buzzing on a Tuesday night in London’s Soho – we were pleased we had booked a table! The food is all excellent. Between the four of us we chose a lot of different small plates to share and think we did a pretty good job of trying most dishes. All great but my particular favourites were Don Ceviche (sea bass) – so fabulously fresh. Choclo Corn Cake with Avocado. Sakura Maru (salmon sushi-esque style). Pollo en Panca (chicken in chilli, orange and pepper jam). The staff were friendly and the tables relatively well spaced. There appeared to be some high long tables where you could join up and eat with others as a two or solo diner.